The modern political era has been party to massive regressions in campaign finance law, as well as corresponding increases in political spending by wealthy groups and individuals. Over the past 40 years, a series of judicial decisions and precedent interpretations have opened the floodgates, allowing a tsunami of money to overtake the political process. 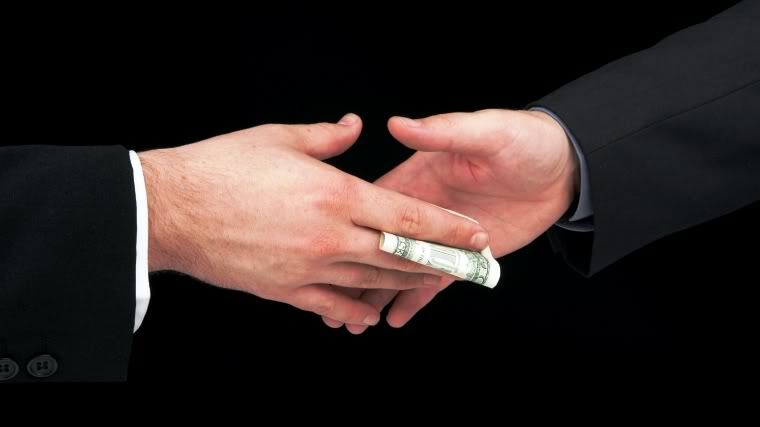 This money, originating from corporations, unions, wealthy individuals and advocacy groups, has sculpted the political landscape into one of gridlock and legalized corruption. Arguably, the first step in the journey which led to the current political climate was the 1886 Supreme Court decision Santa Clara County v. Southern Pacific Railroad. This case’s decision was a vital prerequisite for the current political climate because it was the seed from which “corporate personhood grew. The resolution of a tax dispute between the local government of Santa Clara, CA, and the Southern Pacific railroad led to the including of corporations in the 14th amendment to the Constitution. Interpretations of this case led to a granting of some human rights, most importantly the 1st amendment right to free speech, to American corporations. This decision, while dormant and largely inconsequential in regard to politics for many years, has become the foundation of the argument which allows corporations to spend money in our elections. 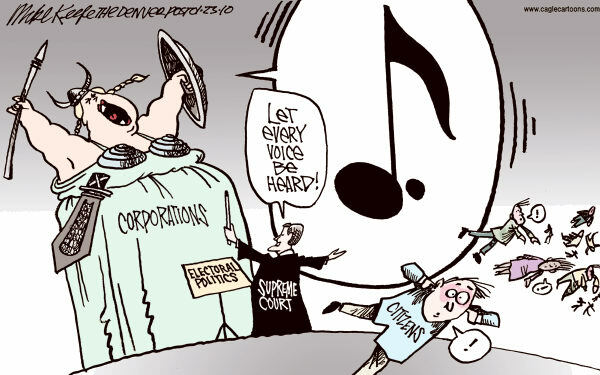 By giving corporations the human right to free speech, the Supreme Court created a situation where they could not be restricted from “speaking” about political matters. In 1976, the Supreme Court decision Buckley V. Valeo redefined monetary donations as just another form of free expression, virtually synonymous with normal speech; while this decision upheld the concept that monetary donations in politics can be limited, its redefinition of money as speech made future regulations of donations very difficult. Due to this decision, donating money became protected speech, and donations to political groups became synonymous with verbal support. The precedent set by Buckley V. Valeo rendered the Santa Clara County v. Southern Pacific Railroad interpretation a vital Supreme Court precedent, as their interaction created a situation where corporations had a protected right to spend money in elections. The now-infamous Citizens United v. Federal Elections Commission decision of 2010 was the decision which finally broke the dam holding back money in politics. Before the Citizens United decision, monetary expenditure, while considered speech, were held in check by limits to the monetary amount which can be donated during campaigns; these limits prevented wealthy individual, as well as non-human collections of wealth (ex. Corporations and unions), from donating unlimited sums of money in support of their political candidates. Citizens United v. FEC rendered limits on campaign spending to be unconstitutional, thus it led to the explosion of money in politics. 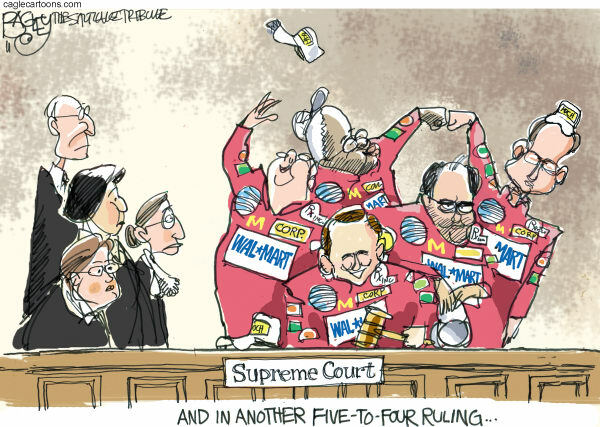 Despite the recent public focus on the judicial mistake know as Citizens United v. FEC, the flood of money into politics was not caused by a single Supreme Court decision; it was brought about through a combination of several decisions, interacting within the law and incrementally increasing the power of money in politics. The granting of human rights to corporations led to a level playing field between individuals and corporation, essentially granting corporations the rights of humans without the legal liabilities or inconvenience of a conscience. The redefining of monetary donations as speech led to corporations, which were then considered people, being given the right to “speak” with their money up to the very limits of the legal campaign donations. The proverbial straw which broke the camel’s back in the fight to keep money out of politics, was the removal of campaign donation limits; this decision led to a proportional level of power based upon money rather than votes – turning our political system from one where “one person equals one vote” to one where “one dollar equals one vote”. Recently, several groups have been attacking corporate personhood, the synonymy of money with speech, and unlimited campaign donations in order to return integrity to our political process. As the primary causes of the recent political crisis are interpretations of the constitution by the Supreme Court, the only remedies to this crisis have become a constitutional amendment or another decision by the Supreme Court superseding their current stance. Ultimately, as Supreme Court decisions can be changed, the only long-term solution to the problem of money in politics is a constitutional amendment banning money from political campaigns. Despite its ineffectiveness as a long term fix, a decision by the Supreme Court increasing the difficulty corporations have while donating money to politicians would help stem the flow of money into politics. I believe that such an opportunity to challenge the current political donation law was opened up by the decision of Knox v. SEIU. During the 2012 term of the Supreme Court, the court heard and decided upon the case of Knox v. SEIU. This case, and the precedent it sets, involves the rights of public unions to compel donations from their members for the express purpose of political speech. In 2005, the California Service Employees International Union (SEIU) attempted to increase its members’ dues for a temporary increase in political spending during the upcoming 2006 political cycle; this increase was minor for each person paying union dues, totaling a sum of $6.45 a month, yet some people objected. Several non-union members, who still paid union dues to their support collective bargaining (referred to as “chargeable expenses”), challenged the increase due to their disagreement with the recipient of the political expenditures of the union; these people sued the SEIU to stop their money from supporting political speech which they didn’t agree with, and, in January 2012, the court was heard by the United States Supreme Court. The decision in Knox v. SEIU, derived from a 7-2 ruling and written by Samuel Alito, decided that the SEIU had violated the 1st Amendment rights of its members by compelling a political donation without prior consent. This decision rested heavily upon the compulsion of belonging to a union, thus supporting political speech by the union, created by current law. Since people were mandated by the government to pay SEIU dues, and these dues were considered “political speech” (due the Buckley v. Valeo defining money as speech and United States v. United Foods Inc. defining compulsory political speech as unconstitutional), the government was determined to be mandating speech. As the government cannot mandate political speech under the 1st amendment, the Supreme Court decided that the SEIU increasing political “speech” without consent was unconstitutional. Current California state and federal law allows for the creation of “union shops” – places of business that require workers to pay union dues, regardless of whether they are union members – and supports the compulsion that all workers must pay union dues. Knox v. SEIU separates the primary goal of the union, collective bargaining, from the secondary goal of political input, and names it unconstitutional for a public sector union to compel donations aimed at political speech. The central premise of Knox v. SEIU can be condensed down to a very simple question: Can an organization which the government mandates citizens to financially support compel those mandated to support it pay additional fees – without prior consent – aimed at supporting the organization’s political speech? The decision of Knox v. SEIU clearly states that such compelled donations without prior consent are unconstitutional infringements upon the 1st Amendment. Excerpt from the opinions of the court – Pg. 2 – written by Samuel Alito in concurrence with Justices Roberts, Scalia, Thomas, Kennedy, Sotomayor, and Ginsberg. The ultimate result of Knox v. SEIU is that public sector unions will no longer be able to compel political donations from members who don’t give prior consent to their funds being used for political speech. While unions are acknowledged to provide a primary service to all workers in a workplace, thus these workers must pay union dues regardless of personal preference, the secondary goals of these unions cannot compel increased funding; in short, by defining the primary purpose of public sector unions as the facilitation of collective bargaining and separating this purpose from that of political spending, the court has reduced the ability of unions to compel funds for their political speech. With the precedent set by the recent Supreme Court Decision Knox v. SEIU, I see the potential for a new line of attack on corporate interests donating money. Instead of simply attempting to attack large aggregations of wealth and power’ (ex. corporations and unions) right to spend money in elections, citizens can use Knox v. SEIU to attack such donations through the argument that such groups are unconstitutionally compelling donations from the public. Public sector unions are not the only groups which utilize government laws and regulations to compel citizens to pay for their activities: Corporations which receives government contracts (ex. Lockheed Martin), corporations whose stock is purchased by public pension funds (ex. blue-chip stocks), military and privatized public good suppliers (ex. private prison corporations), are simply three examples of situation where the public is compelled to invest in a corporation. A corporation which receives government money is receiving funds obtained through the mandated payment of taxes on the public; as there is no way to opt out of taxes or directly control the flow of tax revenue to prohibit the giving of tax money to specific corporations (ex. saying that none of your taxes shall go to Exxon Mobil), the government is essentially forcing taxpayers to support specific corporations. As with the government mandating workers in a union shop to pay the SEIU for their promotion of collective bargaining, it is entirely proper for the government to compel citizens to pay for the corporate contracts utilized by the government to provide for society; tax income has regularly been used to contract the provision of public services and goods to private corporations (ex. military weapons contracts). The problem emerges when the same corporations which receive public funding, raised through mandated taxes, are spending money as “political speech”. If a corporation which has received public money for a service chooses to engage in political speech (and, given the widespread use of lobbying combined with the propagation of corporate subsidies, this is essentially every large corporation) then the government is, in effect, mandating that the average taxpayer support said corporation’s political speech. Just as the SEIU attempted to use its funds to support its political “speech”, corporations utilize their profits to facilitate their own “speech”. Just as the SEIU benefits from government’s “agency shop” rules forcing all workers to support them monetarily, many corporations benefit from the government giving them funding raised through taxes. Put plainly, if the SEIU cannot utilize money collected through government compulsion for its political “speech”, as this would violate the 1st Amendment, no corporation receiving money from the government – money collected through compulsory taxation – should be able to utilize its funds for political speech. If Knox v. SEIU is applied to corporate entities rather than just public unions, as is proper under current free-speech law, corporations could still spend money in politics, just as long as they are barred from receiving any and all public assistance. The banning of private organizations from receiving public monies based upon taxpayers’ objections to such organizations being granted public funds is not unprecedented: The “Title X” ban on abortion providers being paid through public funds, even if their actions are constitutionally protected, was upheld during the 1991 case Rust v. Sullivan. If it is constitutional for abortion providing corporations to be banned from receiving public subsidies (in the form of compulsory tax dollars), assisting them in performing their constitutionally protected services (abortions), then it is constitutional for the government to ban other corporations from receiving such funds to perform other constitutionally protected activities (ex. political speech). This is not to say that such organizations cannot act with private money, but rather that they must perform their constitutionally protected activities – whether abortion or political speech – with private funds. I propose a legal challenge to the United States government, aimed specifically at expanding Knox v. SEIU to cover all corporate and union entities which receive public funds where there is no opt-out. Based upon current jurisprudence, this case would conform to the current law and would drastically reduce the amount of money in politics. If a corporation is forced to choose between the revenue which comes from government contracts, public sector pension investments, subsidies, grants, and contracts, and their ability to freely exercise their first amendment rights to free speech, it is likely that they will choose to relinquish their right to speak. By forcing large corporations to pick between their pocketbooks and their ability to influence politics, concerned citizens can force corporations to voluntarily disarm much of their political apparatuses. As a favorable decision in this case would simply expand the constitutional interpretations of existing laws, there is no need to pass the partisan and gridlocked legislature. Given its past decisions of Citizens United v. FEC and Knox v. SEIU, an intellectually consistent Supreme Court would be forced to side with the challengers’’ interpretations of the law – under current law, political speech restrictions do not distinguish between unions and corporations, thus what applies to unions receiving compulsory funding would necessarily apply to corporations receiving the same. As this legal case does not challenge a specific ideology within free speech, it does not violate the constitutional ban against the government favoring specific types of speech; in fact, a Supreme Court denial of this interpretation would represent a discrimination of speech favoring corporations over unions. Anybody who is currently paying taxes or paying into a government pension program could potentially have standing to challenge the constitutionality of their money being used to fund corporations’ political speech. As corporate profits are not separated by source, a portion of every taxpayer’s taxes, while small, is being used by corporations to fund their political speech. Under the Knox v. SEIU precedent, the use of such money violates the 1st Amendment right to free speech for every individual to be forced to pay the corporation. The current Supreme Court is a highly partisan body and could potentially throw away its own precedent to support the sustainability of corporate power in politics. While this action would be so obviously hypocritical, given their Knox v. SEIU decision, that they would lose face in the public eye, however it is entirely possible that they would act so anyway. Once corporate groups became aware of the effort to cripple their funding streams, the response would likely be enormous. If these corporate groups believed their funding to be significantly threatened by this case, they would likely attempt to crush it with all available resources. 501(c)(4) “Super-PACS” (ex. Crossroads GPS) are considered “social welfare organizations” rather than political groups, thus these groups will still be able to spend limitless amounts of money in politics. Wealthy individuals (ex. Sheldon Adelson) would be left completely untouched by this method of attacking money in politics. As individuals, not institutions, these rich people would be able to bypass the ban on publicly funded corporations and continue to spend limitless amounts of money as a form of political speech. The “revolving doors” of politics and regulatory agencies would still be operational, thus corrupt political agents would still be able to benefit from their corporate patronage; hopefully, by reducing the ability of corporations to support such politicians while seeking re-election, these politicians would be more vulnerable to unseating. As with all Supreme Court decisions, a future court can overrule this decision. Because of its lack of permanence, the use of the Supreme Court to challenge money in politics will always be inferior to the attempt grounded in pursuing a constitutional amendment. By intentionally expanding Knox v. SEIU to cover corporations, it is possible to reduce the money in politics from all groups, regardless of partisanship. Partisan actors are unlikely to get behind the effort to disarm their political apparatus’s funding stream, regardless of whether or not it also disarms their opponents.